The parishioners of St. John’s have made the Christmas season a bit brighter by preparing over 100 boxes filled with household necessities and a few holiday surprises for each of the residents of Rosien Towers. In doing so we have made good friends and created a tradition that all of us – both residents and parishioners – look forward to. Box Contents: 2pk paper towel, 2 boxes of Kleenex, 4pk toilet paper, 1 spray bottle of all-purpose cleaner, standard sized dish soap (638ml), 2pk sponges, small laundry soap, shampoo, body lotion, 2pk body soap, full-size toothpaste, deodorant. 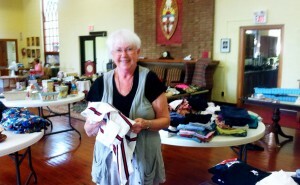 St. John’s provides a bag lunch to those in our community most in need Mon-Thurs from 10:00am-12:00pm. The Rummage Sale Fundraiser, which supports this program will be October 7th and 8th, 2016. Old Town Christian Outreach – Volunteer Day! The fourth Saturday of each month, St. John’s sends a group of volunteers to assist in the soup kitchen at the Old Town Christian Outreach Center. We meet at St. John’s at 9:15am, then report to the Outreach Center and work until around 1:00pm This is a huge help to the outreach center and we represent ourselves well in the community around us. There is no ongoing commitment; simply come when you can. Consider making it a family outing for those of us with older children!